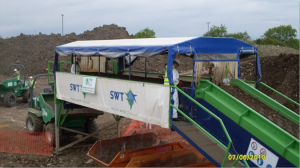 VertaseFLI was contracted by Coventry City Council (CCC) and their consultant Atkins to undertake remediation works at a former WWII landfill site in Prior Deram, Coventry. As part of the works the site was dynamically compacted resulting in a reduction in site levels. The prospect of using Prior Deram as part of a CL:AIRE Code of Practice Cluster arrangement, to import soils reinstating the site to its original levels was discussed and agreed. This was supported by CCC who had sold (and still had an interest in) a former school site approximately 12km away, to a consortium of house builders. The school site was to generate a significant quantity of surplus materials some of which were contaminated. VertaseFLI entered into contractual arrangements with the consortium to prepare an appropriate MMP and import approximately 14,000m3 of surplus soils from the former school site (donor site), onto the Prior Deram site which would become both the hub (treatment) and receiving site. One further variation was incorporated into the MMP when unforeseen cement bound asbestos sheeting (ACM) was encountered at the donor site. This had not been identified during the original site investigations and had not been assessed in the context of suitability for import onto the hub / receiving site. Following discussions with the Consortium and Atkins, VertaseFLI entered into a separate contract with the Consortium to establish a more robust approach to the selective excavation and subsequent hand picking of ACM’s to render them suitable for use at the receiving site. This also included changes to validation criteria at the receiving site. VertaseFLI used an asbestos picking station, comprising a conveyor belt that was loaded with thinly spread ACM bearing soils. The soils were handpicked to remove the ACM’s. 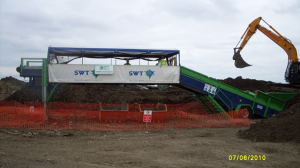 The picking station processed 800m3 of ACM bearing soils and produced 6 tonnes of ACM which was sent to landfill. Without the use of the asbestos picking station, the alternative was to condemn the 800m3 of soils as unsuitable for reuse and export them to landfill. This technique for reducing the volume of disposal can be easily adapted for use on other sites.